I’m very excited to be offering you all the opportunity to win a copy of The Delight Gluten-Free Cookbook before it can be purchased! To be entered to win, leave a comment below with your favorite gluten-free recipe and your email address. I will email the winner on Wednesday, October 1 and send them the cookbook. It’s jam packed with 150 recipes including pumpkin spice cream cheese swirl muffins, beer braised brisket tacos, sweet potato, apple and brie gratin and, of course, desserts like caramel apple and blueberry streusel cake. The goal is to take the fear out of gluten-free cooking and baking by empowering anyone from beginners to experts with the proper knowledge and tools to make delicious tasting gluten-free food that’s easy to make. As many of us gluten-free home cooks know, cooking and baking gluten-free isn’t as easy as substituting the flour. It usually takes some trial and error along with some creativity before getting it just right. 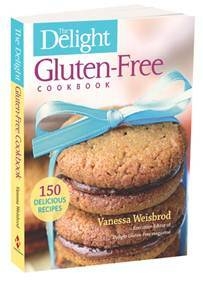 Thanks to Vanessa Weisbrod, executive editor for Delight Gluten-Free, she has done all of the heavy lifting for us. In addition, Vanessa provides great tips and insight into the recipes and ingredients being used; making this cookbook a staple for any gluten-free kitchen. I personally plan to use this cookbook a lot and I hope you find it as useful as I’m sure I will! I have learned so much about cooking since I was diagnosed with celiac disease 5 years ago and I cook way more then I ever did before. Always looking for new recipes and cookbooks to give me ideas. My favorite things to cook are things that are naturally gluten free like stews and roasts but my favorite things to eat are the desserts! I have been gluten-free (b/c of celiac disease) for 25 years. When I first went gluten-free people were clueless, nothing was easy to figure out and the only guaranteed gluten-free things tasted like hockey pucks. Now, we have gluten-free pretzels, gluten-free craft beer, decent gluten-free bread and great cookbooks – like this one – to teach us and other people how to cook this way! I love it. That’s it. Mix it all together. drop small spoonfuls onto an ungreased cookie sheet and bake it at 350 degrees until the tops are dry (about 6 – 8 minutes). Pull them out of the oven and let them sit about 30 seconds before putting them on a cookie rack to cool. Ooooh….so many favorites! I am currently loving an easy vegan mexican casserole: layer tortillas, soy protein, salsa, refried beans. Bake and top with nutritional yeast! Super easy, and super flavorful. It’s awesome for a busy college student like me and probably awesome fer da whole fam! Probably for GF oatmeal cookies. Turns out great every time and very little sugar. Thank you to everyone who participated in this giveaway! I love all the delicious gluten-free recipes and appreciate the time you all took to tell me about them. The winner was randomly chosen. And it is…………..Terri!! Congrats Terri! I hope you enjoy the cookbook and make some tasty gluten-free food. I’ll reach out to you via email to get your mailing address for the book.